Steinberg is pleased to announce the availability of WaveLab 7.2, the latest update to the industry-standard solution for mastering, audio editing and restoration. The 7.2 update provides seamlessly integrated remote control support for Steinberg’s advanced CI, CMC and CC121 models and also supports up to three MIDI-compatible hardware devices. Other highlights include 64-bit versions for Mac and Windows platforms, an Upload-to-SoundCloud function and an updated version of the Dirac 3.5 time-stretching and pitch-shifting algorithm. Plus, WaveLab 7.2 introduces an advanced marker handling system and several workflow and user interface improvements. The update is now available free of charge from the Steinberg website. WaveLab 7.2 is the latest free update to Steinberg’s award-winning solution for mastering, audio editing and restoration. The new version includes 64-bit versions for Mac and Windows platforms and adds full remote control support for Steinberg’s CI, CMC or CC121 control devices or any other MIDI-compatible hardware. Other highlights include an Export-to-SoundCloud function, an updated version of the Dirac algorithm and several workflow and user interface improvements. WaveLab 7.2 comes with a comprehensive remote control support, perfectly integrated with your CI, CMC series and CC121 controller hardware. Adjust plug-in parameters, volume levels or the stereo pan — faster and more convenient than before. Best of all, WaveLab 7.2 also supports the AI knob technology, allowing you to seamlessly control all program parameters with one central knob directly from your Steinberg hardware. WaveLab 7.2 and WaveLab Elements 7.2 are now available as 64-bit versions for Mac OS X Lion and Windows 7 platforms. Edit hundreds of tracks simultaneously, handle extensive batch processes or analyze and restore audio material with utmost precision — with the advent of 64-bit support, your WaveLab experience will be faster than ever. And all the included VST 3 plug-ins, such as the advanced Sonnox restoration suite, are already available as 64-bit versions. Share your recordings with people around the world — SoundCloud is the perfect place to let others hear what you have recorded, mixed and mastered. With WaveLab 7.2, uploading a track to your SoundCloud account can be done within just a few clicks. Simply choose “Upload to SoundCloud” in WaveLab’s File menu or the option in the WaveLab 7 render dialog and you are done. The latest version of the award-winning Dirac time-stretching algorithm now includes several improvements and provides an even better quality. Dirac 3.5 works wonders on polyphonic audio material and stands in a class of its own. 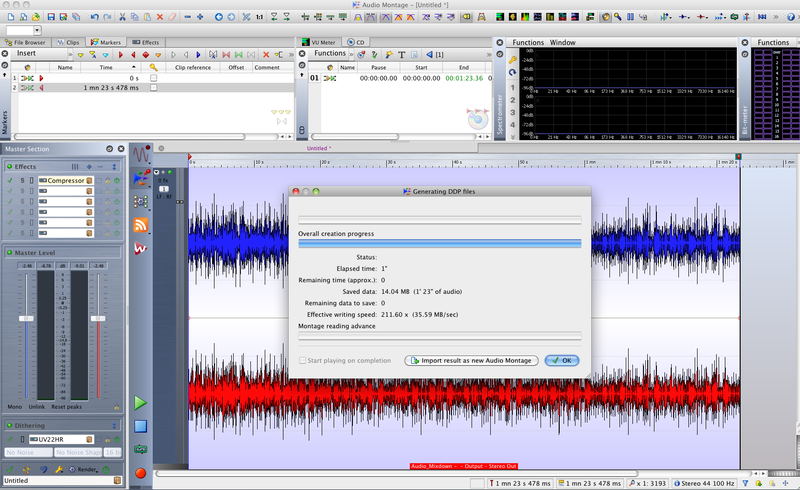 WaveLab 7.2 features an enhanced DDP file workflow. Once you have created a new DDP file, WaveLab 7.2 automatically offers a button that let’s you import the DDP file directly into the Audio Montage area for further adjustments. Creating and editing markers has always been an important part of the WaveLab workflow. In WaveLab 7.2 this workflow has been streamlined as this new version introduces a floating marker window, allowing you to easily create, name — simply manage — all markers and regions in your project. Now you can change fader values using the computer mouse wheel. Plus, pressing Shift allows for fine adjustments, whereas pressing Alt allows for coarse adjustments. Handling several projects and revisions of opened sessions can often be confusing. WaveLab’s Save As function now includes a Save Copy option. No matter if you want to save an audio file or the entire Audio Montage — when this option is activated, a copy of the opened document is saved and the document continues to refer to the source file.